Making decisions is what management is all about. The higher you rise in an organization, the tougher the decisions get—the stakes are higher, there are fewer obvious choices and it’s likely your team is riven by conflict over which choice to make. And the bigger health care organizations become, the harder it is to cultivate effective decision making. We want to be efficient without sacrificing inclusiveness, deliberate but also fast, bold but not rash or impetuous. Management has the tough job of finding these balances. To be clear, we are talking not just about strategy but also about execution—whom you appoint to lead the charge, whether you give your leaders broad latitude or hold them on a tight leash, how you define success, and when you make midcourse executional corrections. 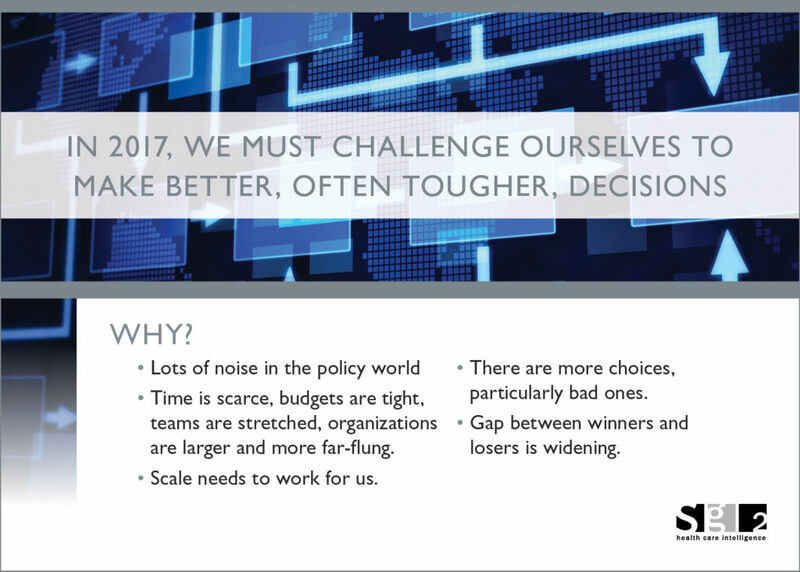 Sg2 believes that 2017 is the year to challenge yourself and your organization to make better decisions. In our 2017: The Year Ahead webinar, Sg2’s President Aaron Gerber, MD, MBA, and thought leaders Bill Woodson and Steve Jenkins explored the decision-making landscape of 2017, focusing on 4 dimensions: your market, your clinical offerings, your organization and your personal choices. Three years ago Sg2 introduced the concept of channel strategy—moving beyond physician referrals to embrace all channels that funnel patients into your clinical programs and then quantifying the sequence and timing of individual patient journeys. Think of it as air traffic control for your System of CARE. Rather than relying on educated hunches, data can map and quantify how patients flow (or don’t) through your System of CARE—spotlighting the bottlenecks that need opening and the exit doors that need closing. It’s a complex and data-rich undertaking, but it works. We are increasingly convinced that mastering patient flow across your System of CARE will be your competitive advantage in the years ahead. Clinical Decisions. We can always manage our hospitals and clinics more efficiently, get better prices from suppliers and avoid throwing sand in the gears of operations. Opportunities for improvement abound on all of these fronts. 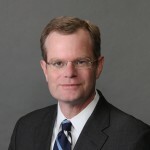 But, in the end, it is clinical decision making that will ultimately make the difference, determining whether health care providers can tame their own runaway cost inflation, at the risk of having more punitive solutions imposed on them. Which test to order, what treatment to recommend, where to refer the patient, how to staff on weekends, when to do nothing at all—these are the decisions (made mostly by physicians) that drive 18% of the US economy. We at Sg2 are tracking the emergence of some breakthrough opportunities that will help clinicians make better decisions on behalf of their patients and enable health care organizations to achieve more consistency and reliability in clinical decision making. Some of these opportunities are organizational. We see an increase in large systems that are effective conveners and funders of local health care delivery networks—providing the clinical leadership, data infrastructure and economic framework needed to drive a common standard of excellence. Other opportunities are technological. Application of artificial intelligence and deep learning in diagnostics and clinical decision support will help radiologists pull richer clinical information from a CT scan and pathologists do more with a sample. This is NOT about replacing physician judgment with the blind protocols of a computer. It is about enhancing physician judgment with better information, so our physicians can be freed from routine tasks and, instead, focused on complex decision making where they are most needed. Of course, I know how to drive from my home to my office—but my GPS-enabled, traffic-sensitive app gets me there more quickly and reliably, allows me to think about more important things during my commute, and can ease traffic around metropolitan Chicago. Consistency and reliability, consistency and reliability—these will be the standards for clinical excellence in our increasingly far-flung Systems of CARE. Organizational Decisions. This is where things really get hard. The consolidation and network building of the past 15 years have produced organizations of impressive scope that have mostly failed, as of yet, to yield improvements in quality or reductions in cost. To be fair, organizations built rapidly via acquisition frequently take time to get their executional legs under them. This is made more complex by the fact that health “systems” typically don’t directly employ all the assets they need to drive performance, and more complex still by the largely not-for-profit structures in health care that engender a less-corporate style of decision making. All of that said, Sg2 sees some hopeful signs from large organizations beginning to make tough, often long-deferred, decisions. We have always known, for example, that 3 joint replacement programs at a small scale located a few miles apart make little sense and—more to the point—will likely drive uneven clinical results and higher costs. Powerful forces have largely kept organizations from rationalizing services. But, recently, Sg2 has seen this begin to change for the better. Perhaps 2017 is the year you begin tackling your organization’s perpetual (and perpetually delayed) tough decisions. Personal Decisions. Of course, the root of better tactical, clinical and organizational decisions lies in the personal—how individual leaders make their own decisions. Maybe the most essential of these is how and where you spend your time: which meetings you attend; which decisions you make personally and which you delegate; how you balance your attention between the urgent issue of the moment and long-range concerns. We’ve learned a lot in recent years, particularly from the field of behavioral economics, about how humans make decisions. On the plus side, we are masters at pattern recognition—synthesizing a continuous wash of information to develop theories about how the world around us works. This is an enormously helpful skill, whether you are a Stone Age hunter-gatherer trying to differentiate the sweet berry from the poisonous one or a modern-day health executive trying to read the nuances of her local market. And our skills at pattern recognition just get better with experience. Feeling good? There’s a negative side, as well. There is strong evidence that as we age, the pattern-recognition models we’ve built in our heads become more rigid and out-of-date. We’re not just resistant to challenging our ways of thinking, in many respects we are cognitively unable to do so. That wasn’t such a problem in the comparatively static world of the hunter-gatherer; it’s exceedingly dangerous in the warp-drive 21st-century health care market. We’ve seen a lot and built up wisdom, but we need to be cognizant of our growing mental rigidity and tendency toward overconfidence in our own instincts. Sg2 sees its defining purpose as helping you and your organization make better decisions. They won’t always be the right decisions—we can’t control everything in our environment, in which change and uncertainty continue to swirl. But we can make better decisions, based on the best analysis and insight available, that have the best odds of paying off. We look forward to helping you make those better, tougher decisions in 2017.